The race will start in Escondido this year and travel north to the finish line in Santa Rosa. This is the first time in the 8-year history of the race that it travels south to north. Stage 1: May 12, Escondido, Start & Finish, 104.3 miles. Stage 2: May 13, Murrieta to Greater Palm Springs, 126.1 miles. Stage 3: May 14, Palmdale to Santa Clarita, 111.8 miles. Stage 4: May 15, Santa Clarita to Santa Barbara, 84.7 miles. 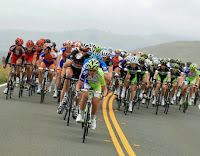 Stage 5: May 16, Santa Barbara to Avila Beach, 116.4 miles. 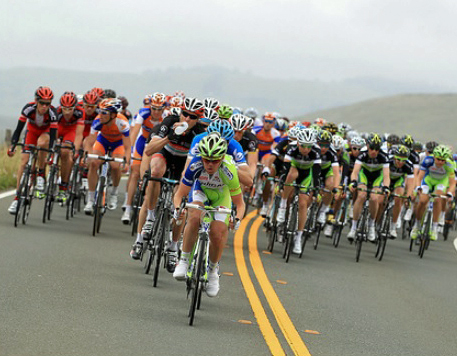 Stage 6: May 17, San Jose, Individual Time Trial, 19.6 miles. Stage 7, May 18, Livermore to summit of Mount Diablo, 93 miles. Stage 8: May 19, San Francisco to Santa Rosa, 86.2 miles. Stage one includes a climb up Mount Palomar, a climb organizers say compares to Alpe d'Huez in France. Stage 2 ends with a 4 mile climb up Tramway Road to the Palm Springs Aerial Tramway parking lot. Stage 6 is the San Jose time trial which ends with a 3 kilometer climb up Metcalf Road. Some of the pitches are over 10 percent. This climb was known as the Metcalf Mauler by triathletes racing the Bud Light Triathlon back in the 90's. Stage 7 Ends with a climb up to Mount Diablo in Contra Costa County. Stage 8 starts on the Marina Green in San Francisco, crosses the Golden Gate and winds through Point Reyes National Seashore. The race ends with circuits in downtown Santa Rosa.